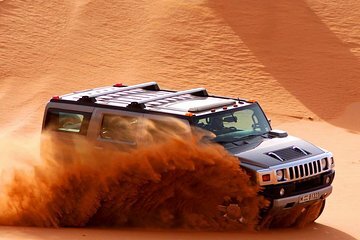 Explore the dunes around Dubai in a 4x4 vehicle on this full-day desert safari. Head out into the red sands, stopping for a camel ride and a buffet dinner in a desert camp. Learn about the local desert flora, fauna, and history through guided commentary. At the camp, take in traditional dancing and entertainment during a cultural show, then head back to Dubai for drop-off. Would highly recommend this excursion.